I was in New York last week for a much needed holiday. On the Saturday we came out of our hotel to find a street market on 8th Avenue. We had some rather delicious pancakes for breakfast and whilst looking around, I found a couple of hand made soap stalls. I am a complete sucker for hand made bar soap, I love the stuff! I visited the Copa Soap stall whilst in the frame of mind that I was going to resist temptation. 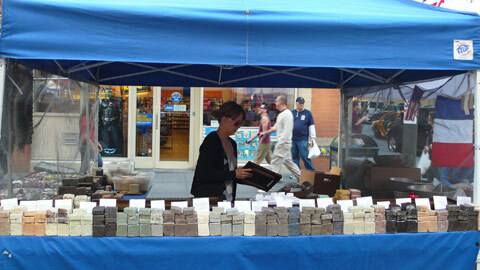 However, the stall owner gave a sample of their lavender shea soap. After walking around with it my hand for 10 mins, it smelt so good that I decided I’d give in and go back and buy some. “Beekman’s C.O.P.A soaps are all natural, biodegradable vegetable oil based soaps for everyday use in the bath and shower. Our soaps are hand made from saponified coconut, olive, palm and almond oils and pure essential oils. We use no artificial ingredients – no perfumes, no dyes, no lathering agents…each bar is hand-cut and air cured”. After much pondering, I bought a bar of Copa’s aloe soap. Splash Organics was the second soap stall I discovered at this market. They make fresh, organic and vegan skincare products. “All our ingredients are certified organic and come from all over the world….all Splash Organics products are hand made with love and care nestled in the Pocono mountains in the beautiful Northeastern Pennslyvania”. I really liked all the unusual flavours of soap available at this stand. These included: moroccan fig (with cranberry seeds), seaweed lime, banana avocado, chamomile with grape seeds, pumpkin and frangipani jasmine. In the end I decided to go for a bar of mango soap. The way in which seeds had been applied to some on the soaps (in particular the moroccan fig with cranberry seeds on top) reminded me of the visual appeal of Lush’s soap and shampoo bars. I think markets like these are a great way to discover new brands and unusual products. 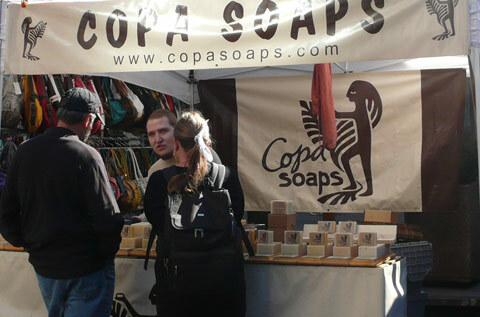 Until I had been to this market on 8th Avenue, I’d never heard of Copa Soaps or Splash Organics. Also, because this market wasn’t specifically a natural market, it made me feel like I had found some hidden gems! Once these soaps have been tried and tested, a review will be added to the product reviews section. Is anyone familiar with Copa Soaps or Splash Organics? Sounds like a great find. The best thing about this type of soap is great smells and flavours. Be careful when you use them as one bar I had got very soft once wet!